Heroes never live and legends never die. Please don’t open threads that bring tears to my eyes. The last legend of Pakistan cricket! That's amazing to do play such quality innings at this stage & age of his career. The likes of Warner, Smith, Malik, Lewis, Tamim, Kayes all struggled on the pitch. In he comes and wins the match by making batting look so easy. True legend of the game! Still a much better all-rounder than Shadab and a much better hitter than Asif Ali. If he could have kept his ego in check and not lust for captaincy, he could have easily played T20s till 2020. He doesn’t have the fitness to bowl 10 good overs anymore. However, if Asif can play as a specialist slogger, so can Afridi. normal day at the office that. I know guys he has retired but looking at his form in the BPL, I think he can still do a lot better job if not worst compared to Yasir or any other spinner in the team given the fact that he has good records at England venues. I think he will be crucial in our chances of winning the World Cup. What do you guys think? I question whether it was wise to allow Afridi to retire after the 2015 WC, Pakistan Cricket still needed that one iconic player to attract sponsors and eye balls. Yeah I didn’t think it was the right time for him to retire, he could have easily played 2019 World Cup. He is still very effective alrounder pakistan can get back and improve their chances of winning the World Cup as he had shown us how much valuable contribution he can make in World Cup 2011. Still the best power hitter in Pakistan, simply no comparison. He may make a comeback in 20 20 . 12.4 Nazmul Islam to Shahid Afridi, OUT, Gayle catches at short third man. Shahid Afridi overcame pain in his knee to roll back the years and put in another Player of the Match performance. 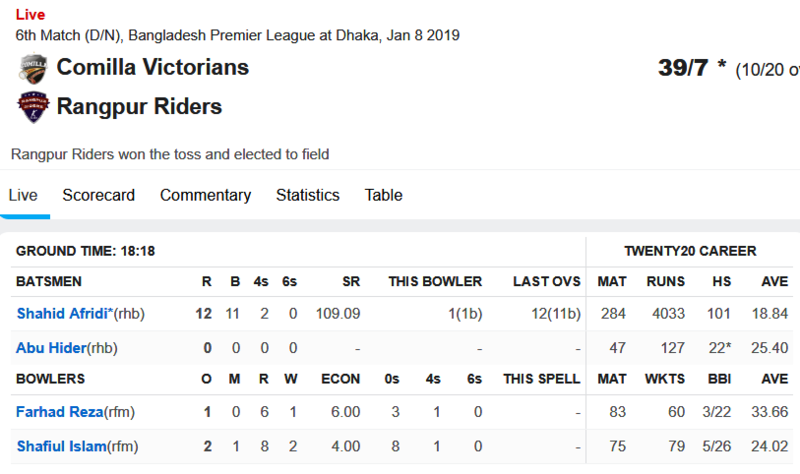 This time, it came for Comilla Victorians in the Bangladesh Premier League. Coming on to bowl in the eighth over of the innings, he struck with his very first delivery, trapping Mehidy Hasan, the Kings captain, lbw for 30. That was the big wicket, and he immediately followed it up with another to have two in two when Laurie Evans was dismissed in a similar manner. He missed the hat-trick but came back in the next over to have Qais Ahmad bowled for a first-ball duck. The veteran, who earlier this year became the first Pakistan player and only the third ever in the world after Dwayne Bravo and Shakib Al Hasan to do the double of 4000 runs and 300 wickets in T20s, admitted that pain in his knees had been bothering him, even as he played through. The performance marked his second Player of the Match award in three games this season – the first one coming for his 39* off 25 balls and 1/29 in his opening game. Imrul Kayes, standing in as captain for an injured Steve Smith, hailed the work of the bowlers to restrict the opposition to 124 in 18.5 overs on Friday. Comilla openers Anamul Haque and Evin Lewis got the chase off to a strong start adding 65 for the opening wicket, before Tamim Iqbal provided the finishing touches. A LOI ATG, well deserved! Afridi is an ODI ATG with avg of 23 with bat and 35 with ball? That's what make him even greater! Why did he retire from T20Is? He is still fit.